Honestly, if I went back in time and told my 10 year old self I loved Brussels Sprouts, she’d probably cry. No, I wasn’t really one to cry. Kicked or bitten would be more like it. Luckily she’s back there, and my present self is safe so I can go back to shoveling mounds of Brussels Sprouts into my mouth. I’m not really that addicted. I can live without them, but why? They’re super tasty and healthy as can be! Until you start sauteing them with oil and bacon and other unhealthy stuff. But isn’t that part of what makes them so tasty? If you really want to try some Brussels Sprouts gone junk food, check out Food Freak’s Crispy Brussels Sprouts. They’re fried up then tossed with agave nectar and some sweet and savory spices. Guarantee you can’t just eat one (bowl). That was kind of my inspiration for my own Sweet and Savory Brussels Sprouts. 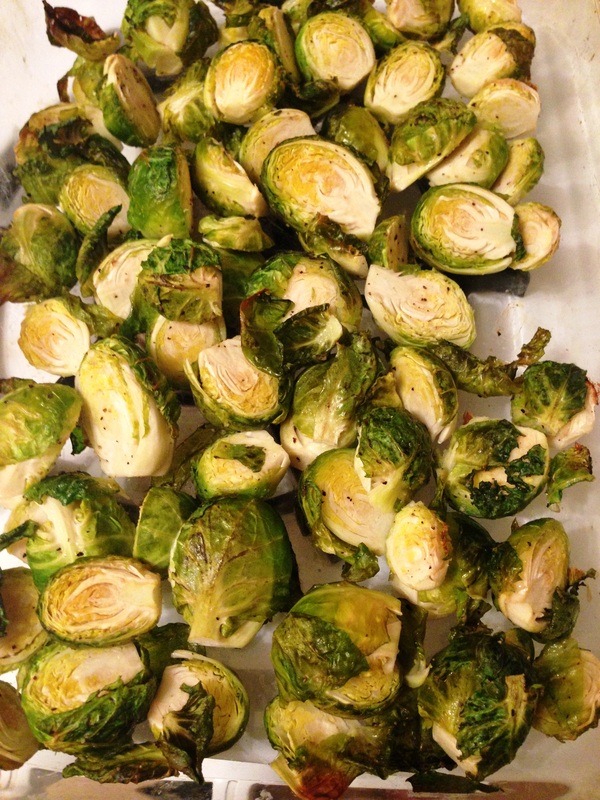 I love roasted Brussels Sprouts, just plain with salt and pepper but I wanted to kick up the flavor a bit. A little more salt…bacon anyone (pancetta really–I was in a fancy mood) and a splash of balsamic for a hint of sweet. If you really want to be healthy, cut the pancetta. It should still taste good, but you might miss that salty almost crunchy texture. Preheat oven to 450°F. Cut bottom stem off Brussels Sprouts and cut in half. Discard any browned or wilted leaves, but be sure to save the good ones (they crisp up well when roasting!). 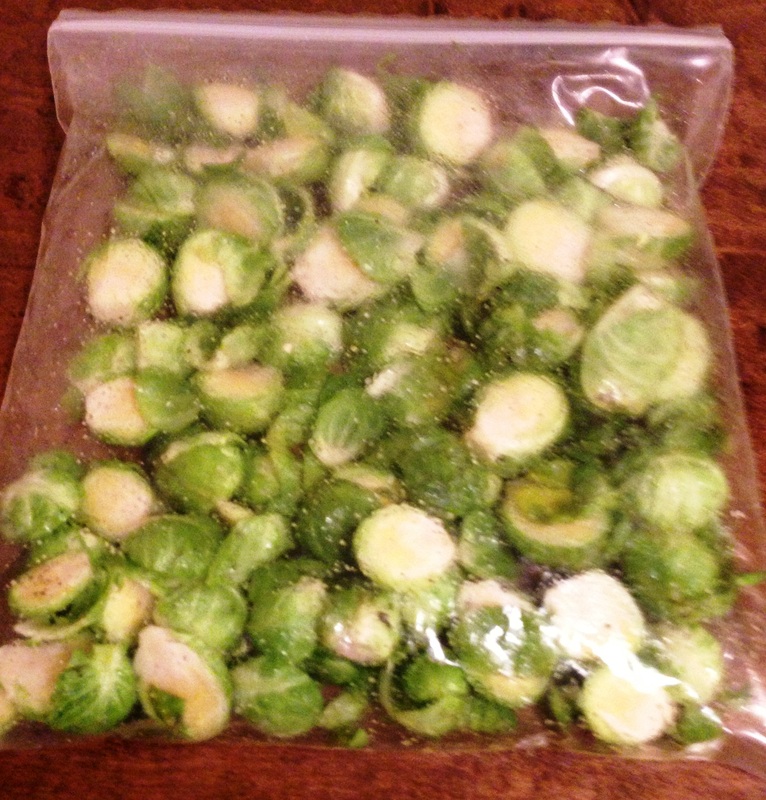 Put Brussels Sprouts in a gallon Ziploc bag along with the olive oil, salt, pepper and garlic powder. Seal the bag and shake, shake, SHAKE! until sprouts are well coated. Pour sprouts into a 9×13 casserole dish and roast for 45 minutes until tender but still a bit crunchy. Meanwhile, chop pancetta into small bit sized pieces. In a skillet over medium heat cook pancetta. Once the pancetta starts to cook and oil forms in the pan, add the shallots. Cook until shallots are slightly translucent and pancetta is crispy. 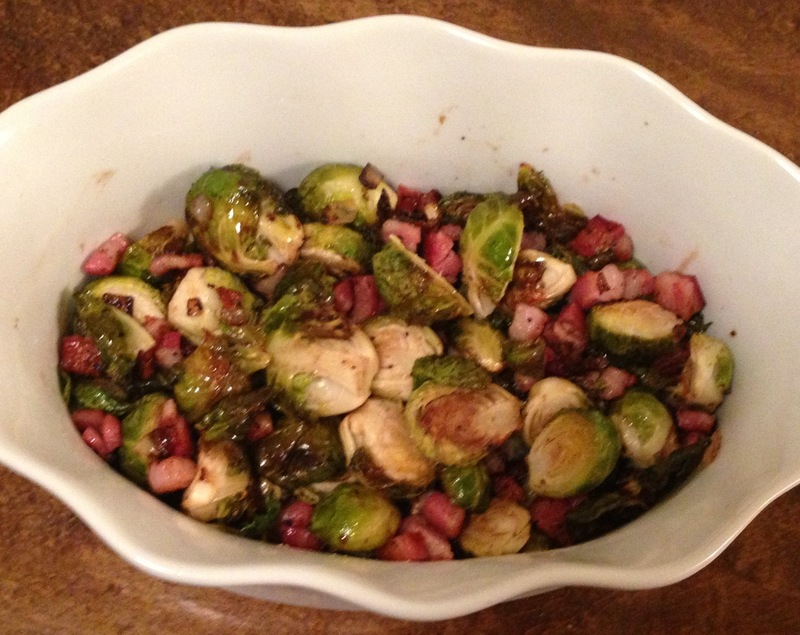 In a serving bowl, toss Brussels Sprouts, pancetta and shallots well. Drizzle with balsamic vinegar and toss again before serving.